This is amongst the oldest and most widespread form of handicrafts. Historical records of prehistoric era have been found in the remains of pottery. It is believed to have existed since 7000 BC in the Neolithic period. Apart from the popular terracotta or fired clay products, other products are the stoneware which are fired at over 1150 degree C.The translucent form, also known as porcelain is also very popular. The raw material for this craft is ordinary clay, derived from the beds of water bodies like river, lakes and ponds. 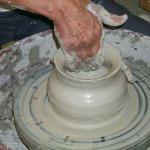 The clay is cleaned, mixed and ten shaped either by hand, wheel or molded into desired object. The items are dried, fired and glazed as per the requirements. The clay or terracotta products are graded according to their color, strength and water absorption capacity.